Waratah Bay is one of Victoria’s hidden gems, situated 160 kilometres south east of Melbourne. The bay gets its name from a ship named the SS Waratah captained by William Bell which, in the 1850s, became damaged whilst rounding Wilson’s Promontory, seeking shelter in the bay. 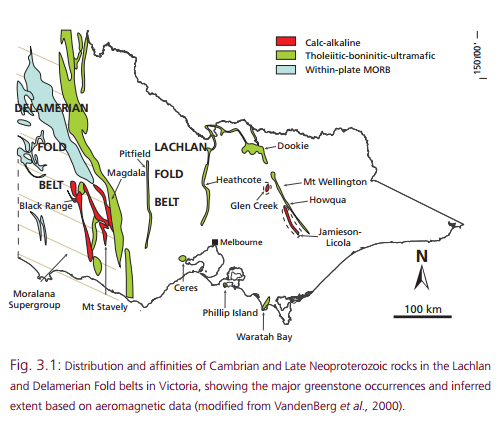 Cape Liptrap (Figure 1) is a significant geological teaching site in Victoria, with the spectacular geological sequences ranging in age from folded Cambrian rocks to recent sands. 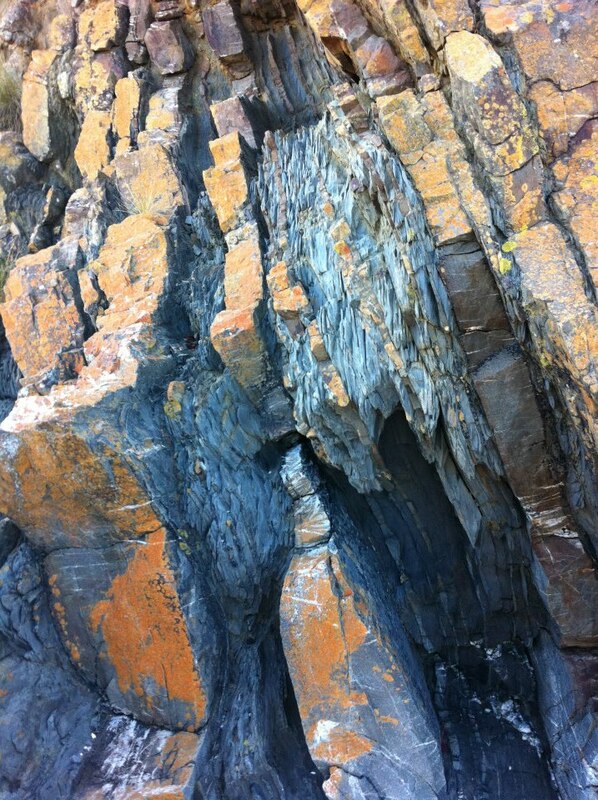 in fact anyone who has studied geology at university would be lying if they said they didn’t know each fold inside-out. The map above shows the Cape Liptrap Coastal Walk from Venus bay to Walkerville, divided into three sections, each with a different geology type or theme. 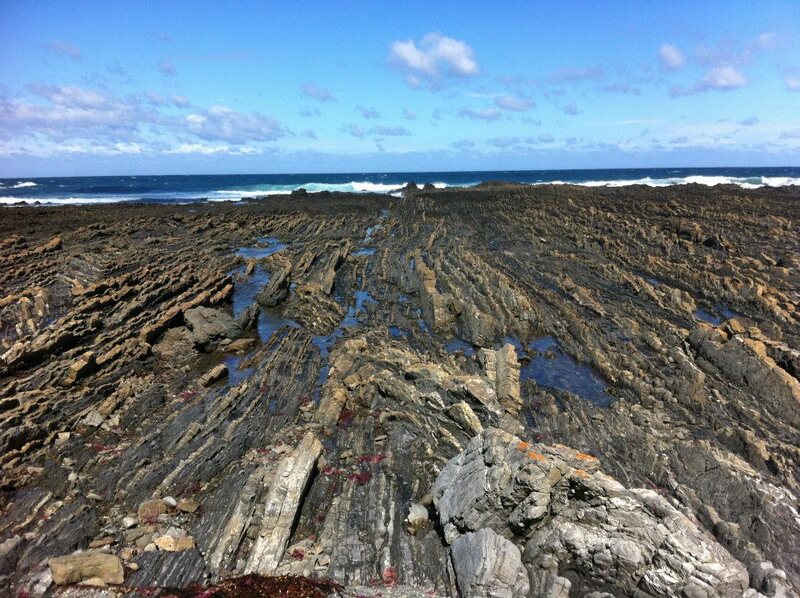 The first stretch from Venus Bay to 5 Mile Track is a leisurely day trip along modern beach sediments. The second stretch from 5 Mile track to Cape Liptrap covers predominantly tightly folded and faulted Devonian Cape Liptrap Formation. The path is often indistinct, tracing narrow cliffs and steep gullies, so it is advisable to take a good map or download a GPX file to navigate. Taken together, this is a one-way, two day walk. It is advised not to start a walk in this area any earlier than two hours before a low tide and aim to finish a walk no later than two hours after low tide. Tide times are the same as for Port Phillip Heads. The third stretch from Cape Liptrap to Walkerville traces complex faulted blocks of Cambrian, Ordovician and Silurian limestones and volcanics. This section is also only recommended for experienced walkers. The entrance to the beach is a steep drop. From the top of the cliff you should be able to see the NNE striking, south plunging near-vertical chevron (really tight) folds of the Lower Devonian (500 Ma) Liptrap Formation (turbidities). Turbidities are inter-bedded quartz-rich sandstones, thin mud stones and massive sandstones. Cross-bedding, flute clasts, hummocky bedding, ancient ripples and graded beds can be seen in the alternating layers. These structures tell you which way the beds were deposited, because when they’ve been folded this much you can’t tell! There are also Slickenlines at the site of the fold stack (just near the center). The steps – which are like Lego blocks – indicate the way the rocks have moved past each other in the bedding planes. Quartz veining can also be used to indicate the movements. This map shows how this location relates to Kitty Miller Bay – they are the same age (Waratah and Philip Island) and both greenstones. There are a number of hikes and bush tracks which take you over wave-cut platforms and provide plenty of outdoors adventure (i.e. 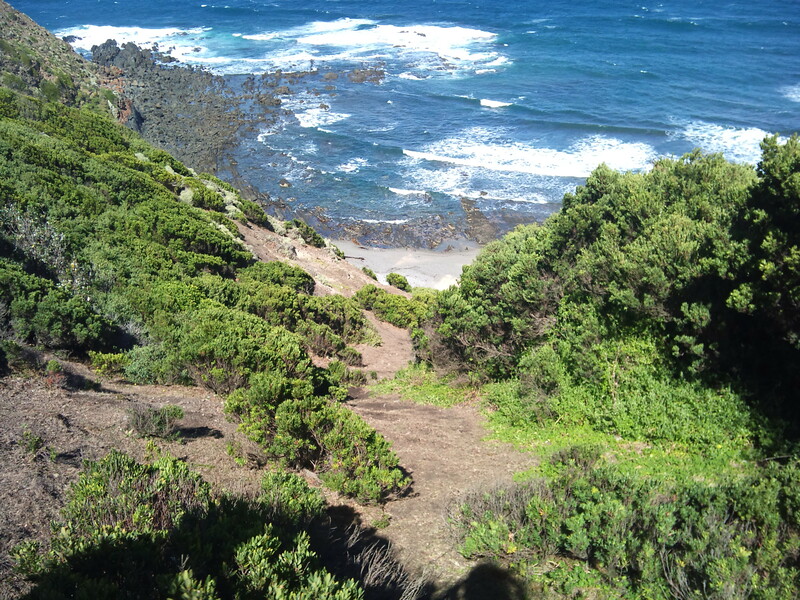 Cape Liptrap to Venus Bay, 19km). Make sure you are aware of the low tide times and take precautions. There is a small camping area near the car park (no facilities). Tip: Behind the fold stack, if the tide is low enough is another cool fold to look out for… but you have to slide on your stomach to get to it. This is probably one of the most beautiful coastal areas in Victoria, up there with Wilson’s Prom and The Otways – and highly underrated. I’d definitely recommend a weekend or day trip here. At Walkerville South you can see ruins of the original Walkerville Lime Kilns. The limestone deposit was discovered in 1875, one of only three deposits known at the time. Limestone was used in building materials and in the production of plaster. The quarry and lime kilns became a thriving industrial centre, operating until until 1926. Other remains at the site include: a jetty, tramway, cemetery and archaeological remains of the township. Figure : Walkerville Lime Kiln and Quarry ruins. Source. In 1913 the Cape Liptrap Lighthouse was constructed to improve the safety of coastal shipping (Figure ). This first lighthouse was a 2.1m steel tower with an acetylene light. The current concrete lighthouse was built in 1951. A keeper was never stationed at the lighthouse. Figure : Cape Liptrap Lighthouse. Source.